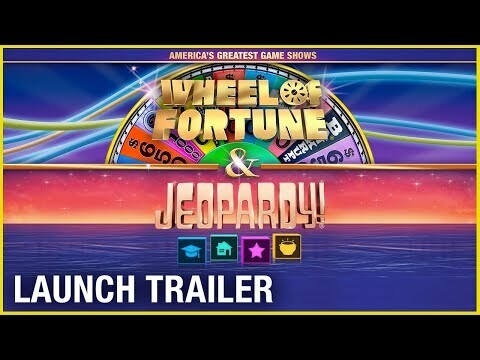 Home ... Casual Gaming America’s Greatest Game Shows: Wheel of Fortune & Jeopardy! Enjoy an authentic TV show experience with America's Greatest Game Shows: Wheel of Fortune® & Jeopardy!® Play anytime, anywhere. Perfect for a family-friendly game night – or challenge yourself against players around the world online. Jeopardy! is a registered trademark of Jeopardy Productions, Inc. © 2018 Jeopardy Productions, Inc. All Rights Reserved. Wheel of Fortune is a registered trademark of Califon Productions, Inc. © 2018 Califon Productions, Inc. All Rights Reserved. Game software © 2018 Ubisoft Entertainment. All Rights Reserved. Ubisoft and the Ubisoft logo are registered or unregistered trademarks of Ubisoft Entertainment in the US and/or other countries.